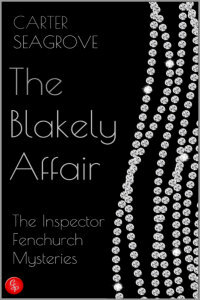 The Blakely Affair is the introduction of Alfred Fenchurch and his partner, Adam Cowley, as they investigate the death of the Dowager Baroness Anglemere and the theft of her fabulous diamonds. Who did it? Jane the maid, James the houseman, Cook, Samuel the one time stage-hand, Doctor Fulke or the Dowager’s daughter, Theophilia or perhaps it was her husband, William Dorchester. Nothing is quite what it seems. The Blakely Affair is a more traditional ‘whodunnit’ and we have created a police inspector by the name of Alfred Fenchurch to carry the investigation forward; not that it majors on the police procedural aspects of the many stories which fit into the genre. Ours is more character-led … and of course, we both had absolutely no hesitation in casting Alfred as gay or in giving a romantic side story with the relationship between the Inspector and the character of PC Adam Cowley.